AVM FRITZ!Fon MT-F / M2 / C4 / 312BAT006. 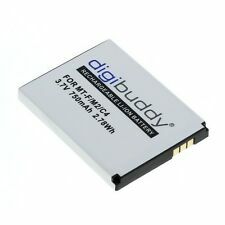 digibuddy Akku für AVM FRITZ!Fon MT-F Li-Ion. Kabel & Adapter. Capacity : 750mAh. Type : Li-Ion. Weight : ca. 17g. Kapazität /. Technische Daten. Uniden EXP1240, EXP1240H.Ersetzt den Akku-Typ: 10000058, 3BN67332AA, RTR001F01, FREESTYL2BA, A051, 51015404, 690104, 1000060. Maße: ca. 53 x 34 x 6 mm.Kapazität: 1300 mAh. Hochwertige Zellen mit langer Lebensdauer. 1x Cisco 7921G 74-4958-01 IP Phone Battery. Compatibility: For Cisco 7921G IP Phone. Physical condition: Factory Sealed. Local pickup is always available. Actual item is shown in the images. Product Information. BT8001, BT8000, BT8300, BT18433, BT28433, BT184342, BT284342, 89-1335-00, 89-1344-01, BATT-6010, CPH-515D. Radio Shack CORDLESS PHONE BATTERIES - Many Models To Choose From - All New! HQRP trademarked products. Cordless Phone Battery compatible with Vtech. Vtech LS6425-3 / LS6425-4 / LS6426-3 / LS6475-3 / LS6475-2. Compatible P/N: Vtech 89-1348-01;. 100% compatible with Original Battery;. EL51110 EL51209 EL52103 EL52113 EL5220. EL52200 EL52203 EL52210 EL52213 EL52250. 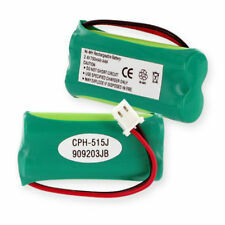 Replaces these batteries SIZE: 1.75"L x 0.88"W x 0.38"H. PWR : 2.4 Volts 750 mAh. TL92270 TL92271 TL92273 TL92320 TL92370. 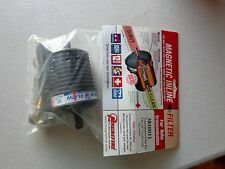 Magnefine is covered by worldwide patents. Over one million filters have been installed on transmissions and power steering units. Fleet operators appreciate Magnefine labor savings at service and how it extends transmission life. 3 RAYM 195 3.6V 1500mAh. RAYOVAC CORDLESS PHONE BATTERY SET OF 3. This Battery Pack is New in Package. Thank you for your interest in this Item. Everything comes from a smoke and pet free environment. Shipping is always every week day and almost always on Saturdays. There is a 60 day money-back guarantee on all listings. Please message any questions, as they will be answered in a timely manner. Thanks for your time and confidence. Leviton C2431 cordless phone battery. Rated 3.6V 280mAH. For use with the following cordless phone models. (SKU # LC2431-5PK; Weight: 0.7 lbs.). Nickel Cadmium. Uniden: XE-500, XE-300, XE-400. NW Bell: 500. 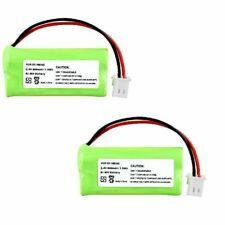 3.6V 300Mah Nicd Cordless Telephone Battery Fits: AT&T 1145 22030X 2000-7000 Series E1802 HT-1500 & Others GE: 2-9300 Through 2-9800 Series & Others SBC: CL250 CL500 FT4150 FT5505 & Others Uniden: 5824 911 & Others Vtech 2101 5111 GZ2335 T2350 VT2417 & Others.3.6V VT2417 & Others. Model#: CW-PTCS50HPC Part #'s: 65358-01, 64399-01, PLN-6439901, CPP-512Q. PowerMax 5.8GHz 30878864022, Powermax 2.4 GHz, GE TL26402, GP 80AAALH3BMX, 80AAALH3BMZ. 100% compatible with Original Battery;. Keep in touch with friends and family and never miss a conversation;. We " Strive for 5. DECT-3181 DECT3181, DECT-3380 DECT3380, D2380, D2380-3H. BT-1018 BT1018, BT-1022 BT1022, BBTG0743001. 100% compatible with Original Battery. & Handling Information. We " Strive for 5. Thewarranty and the technical support - You can always turn to us for qualified help;. VTech CS6124 / CS6124-11 / CS6124-2 / CS6124-21 / CS6309. VTech CS6124 / CS6124-11 / CS6124-2 / CS6124-21 / CS6309. HQRP trademarked products. Cordless Phone Battery compatible with. 100% compatible with Original Battery;. Alle Lithium-Ionen Zellen dürfen nur mit Schutzelektronik betrieben werden (Tiefentlade. - u. Überladeschutz)! Bei falscher Handhabung bzw. Hierzu zählt eine fachgerechte Bearbeitung und Verarbeitung der Zellen, sowie die ordnungsgemäße Einlagerung. EL52260 EL52300 EL52303 EL52313 EL52350. EL52400 EL52410 EL52450 EL52500 EL52510. U.S.A. DISTRIBUTOR. SIZE: 1.75"L x 0.88"W x 0.38"H. PWR : 2.4 Volts 750 mAh. TL92371 TL92372 TL92420 TL92470 TL92471. HIGH CAPACITY - 600mAh -. Capacity: 600-mAh. Uniden 900MHz Phone Models Uniden 2.4GHz Phone Models Uniden 5.8GHz Phone Models Capacity: 600mAh. Composition: NiMH. Uniden DECT 6.0 Phone Models Uniden 2.4GHz Phone Models. Uniden 900MHz Phone Models. New and upgraded version now 600mAh NiMH will last 20% longer than previous version of this battery. Size: 2x AA. Replaces batteries mAh of similar size and shape. Compare shape, size and plug for match. Panasonic - KX-5776, KX-5777, KX-TG2411, KX-TG2420, KX-TG2420B, KX-TG2420W, KX-TG2421, KX-TG2422, KX-TG2422W, KX-TG2424, KX-TG2431, KX-TG2431W, KX-TG2432, KX-TG2620, KX-TG2621, KX-TG2622, KX-TG2631, KX-TG2631W, KX-TG2632, KX-TG2632B, KX-TG5771, KX-TG2620, KX-TG2622, KX-TG2632, KX-TG5761, KX-TGA241, KX-TGA242, TX-TGA243, KX-TGA246. GE RCA Batteries: 5-2814, 5-2826, 5-2540, 5-2734, BATT-6010, CBD8003, CPH-515D.